Contrave can cause adverse reactions, just as many other medications can. As for the intensity, Contrave side effects can be mild or severe. Patients, taking the anti-obesity treatment course, must not worry too much about Contrave side effects listed above. According to Contrave reviews, these adverse effects occur at the beginning of using Contrave slimming tablets and usually do not last long. However, when Contrave side effects cause too much discomfort and do not go away, a patient should visit a doctor. In most cases, side effects are caused by using an increased therapeutic dose of Contrave, or individual features of a patient’s body. Many Contrave side effects reviews indicate that adverse reactions go away as soon as the patient’s body gets used to a new drug. Still, it should be said that during the clinical trials of Contrave weight management product, scientists found out that this diet drug could cause severe side effects as well. 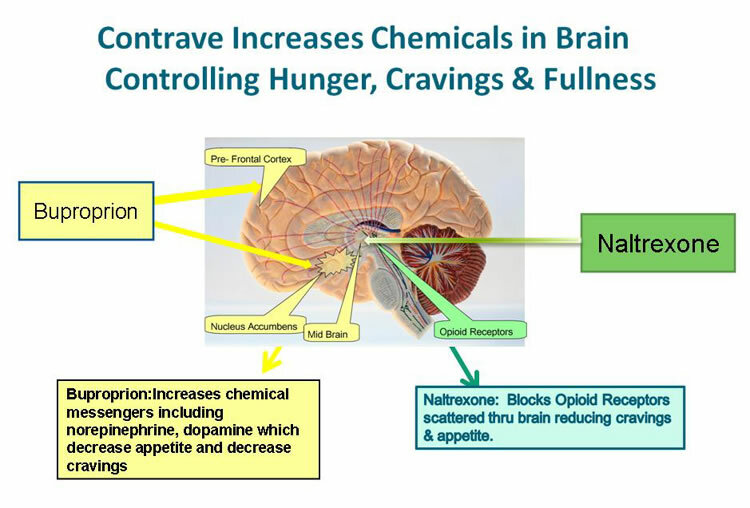 One of the active ingredients of Contrave is called Bupropion Hydrochloride and it has been used in modern medicine as anti-depressant drug for a long time. Exactly Bupropion can cause severe Contrave side effects, such as suicidal thoughts or actions. When using Contrave diet pills, it is necessary to pay attention to sudden mood swings, change in behavior, thoughts and feelings of a patient. As it is indicated in the Prescribing Information, there is a high risk of seizure during the therapy with Contrave. Usually Contrave side effects arise under the influence of high dose of Contrave or in a combined use of Contrave and other medications. According to clinical experience, it is possible to minimize the appearance of seizures if a patient adheres to the recommended daily dose, which must never exceed 360 mg of Bupropion. Some patients mentioned sweating as one of adverse effects while using Contrave diet pills in their Contrave side effect reviews. In fact, men had suffered from excessive sweating more than women. It is noteworthy that side effect lasts for a short time and once the patient stops using Contrave sweating goes away. As it is said in Contrave reviews, Contrave slimming medication can affect the liver function. When using Contrave diet pills, there is a great risk of liver damage and hepatitis. It is partially caused by other active ingredient of Contrave weight loss tablets – Naltrexone. Contrave diet pills can cause low blood sugar (hypoglycemia) in patients, suffering from type 2 diabetes. To avoid hypoglycemia, it is recommended to reduce the dose of antidiabetic medications and measure the blood glucose levels regularly. If patients notice these symptoms, they should stop using Contrave and consult a physician.